Outdoor team building activities are a great way of bringing your team together outside of the corporate work environment, clearing the air - literally and also encouraging communication and an environment that can promote a team focus towards problem solving. 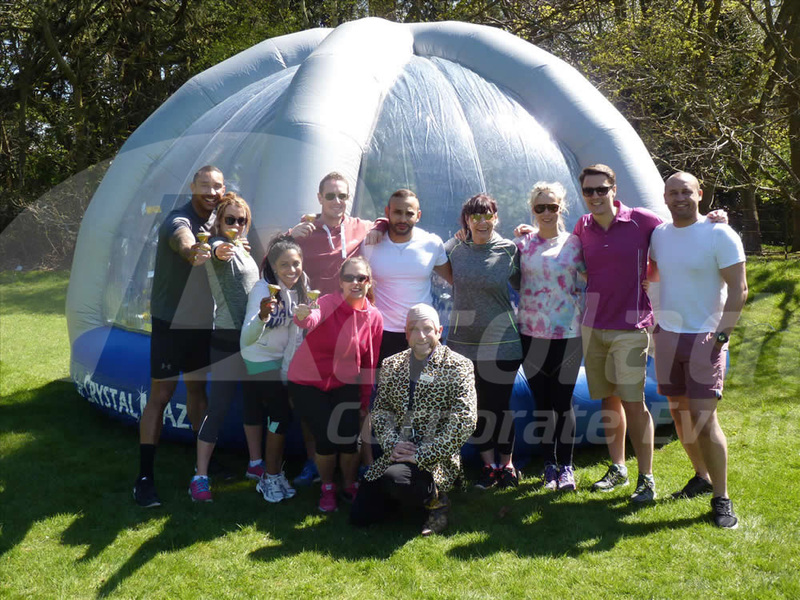 Of course at Accolade Corporate Events, we've got a whole host of effective and fun outdoor team building activities for you to choose from but we're going to focus on three fun team building events that specifically target problem solving. Why not call our events team today on 0800 083 1172 and ask for a free no obligation quote. See more outdoor team building activities. Based on the popular 90s TV show, the Crystal Maze team building event will really put your team through their paces. This is a great event for those of mixed age and physical abilities as each of the challenges are uniquely different and require different skills to overcome. Can your team show their bargaining skills and time management? As in the hit TV show, the teams are sent out with an obscure shopping list - the team that comes back with the most items and the most spare cash left is crowned the winners. However, unlike the TV show - nobody gets fired! Our Spy Catcher team building event is a great way to really get to see a city and all her sights. We set challenging tasks and goals that require a variety of skills to achieve, all leading up to finding the spy and their location. Our corporate client who is in the private finance industry in London, had hosted a number of different evening entertainment events with us before entertaining their clients and after hugely successfully events, they asked us to organise their annual team building event. They had a good brief, it was to be an event that could easily cope with 100 people, it had to be outdoors, they wanted activities that included problem solving and they needed it to be challenging but a lot of fun! Of course we were only too happy to put forward our Spy Catcher event - so much more than a treasure hunt, this was tailor made for our client and saw teams communicating and racing around London. As with all our outdoor activities Spy Catcher was precision planned and had lots of different elements to suit all different kinds of personality traits within the team. Based around the West End of London, the first problem that the had to solve together was a memory activity before they could even begin to start on the outdoor element. Once outside, teams had to track down secret agents and obtain vital information from them. They had to take a series of photographs both outdoor and indoors and they had to answer a number of coded questions, it was fast paced, it was exciting and it was fun. The client was delighted with the event, how the teams were out of the normal corporate environment and could really bond as a team. They saw their teams communicating and problem solving in a relaxed and fun way. The day was a huge success. Our client, who works within the local authority, wanted outdoor team building activities that were a lot of fun but very much focused on team building, they wanted their teams to really stretch themselves and to try to encourage communication and out of the box thinking. The Crystal Maze team building event was ideal for them and they were very excited. Based on the TV show our corporate event has many challenging and mystifying problems to be solved within the different zone and we certainly put the teams through their paces as they raced against the clock trying to solve the different problems. With this being an outdoor event, our client was concerned about the weather - what if it rained? We helped them to book a cost effective wet weather plan just in case, this way the show could go on without any problems. On the day however, the sun was shining and we hosted the event outdoors as planned. The feedback that we received was fantastic and our client is already talking to us about next years event. We've hosted hundreds of Team Apprentice corporate events, in fact we're proud to say that we were one of the first team building companies to launch Team Apprentice - so we as you can see, we're the experts! Our client didn't know if they wanted indoor or outdoor team building activities, so we suggested Team Apprentice as it has the perfect balance, tasks that are completed indoors and then the outdoor Buying Task. The Buying Task is always a favourite on the day. We worked very closely with the client and visited their location prior to the event to ensure that we picked the most suitable items for teams to track down and buy - items that were both achievable but obscure at the same time, some items that would test teams lateral thinking and negotiation - a key element to the buying task is communication and planning. Without clear communication without each other and strong problem solving, they would be coming back empty handed. The teams loved the tasks and activities and even surprised us with their ingenuity! Their were lots of smiling faces, lots of conversation and it was clear that individuals within teams were bonding, there was a team cohesion that was strong before and that, our client declared, was the sign and a brilliantly successful team building event!